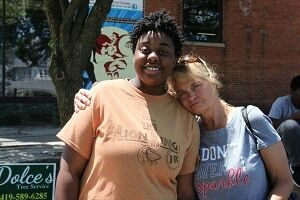 Cheri (right) with a student at the MVM Missions Trip. I’d only been hanging out with the teens at Monday night Campus Life Club for a few weeks when they started talking about their summer missions trip that they call Mohican Valley Mission Trip. They talked about how they get to serve the elderly in Mansfield during the day and have Bible studies in the evening. I still wasn’t too sure what it was all about when our Ministry Site Leader Stephanie Stanforth asked me if I would help chaperone for the week. I was reluctant. I felt I was too old to relate to the teens and even keep up with them at camp. But Stephanie was encouraging and mentioned we would also have a fun day at Cedar Point. That sounded fun so I signed up. I stayed in the cabin with the girls and other chaperones. I found it challenging to relate to the girls that I hadn’t gotten to know yet. One evening at lights out time, “Adriana” gave me a particularly hard time. The ministry leaders said that I needed to have a follow up conversation with Adriana about how to treat adults. When I got time with her I encouraged her to tell me some positive attributes about herself and show me what “nice Adriana” would look like. She could not tell me anything she liked about herself. That made me very sad. After camp, I would see Adriana at club but she rarely acknowledged me. Just recently I got another chance to talk with Adriana when I drove her home from club. We kept the conversation casual but when I got to her home she wanted to introduce me to her mom. As I was getting ready to go, Adriana HUGGED me. I was so surprised and heartwarmed by this because she has never been affectionate to me or anyone else that I’d seen. Since then, Adriana acknowledges me when we are at club. I don’t expect warm and close relationships with teens, especially the ones who come from difficult backgrounds where they do not have positive role models in their lives. Some weeks I might not even feel like I am making a difference by attending…but each week God brings me back and I get to know the kids more and feel a deeper burden for them. Volunteering with kids who are so much younger than me is definitley out of my comfort zone. But what I've learned is that they just need stable people in their lives who will listen and accept them...and I want to be that person!